A ladder rests against a wall. The top of the ladder touches the wall at height $12$ meters. The length of the ladder is $4$ meters longer than the distance from the base of the ladder to the wall. Find the length of the ladder. 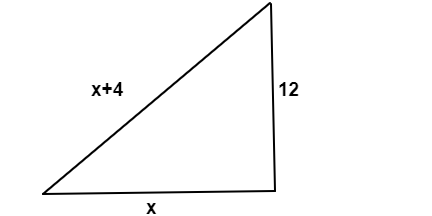 I am confused as to how to deduce the hypotenuse from the information given above. And have sat here trying different things with no success. What am I missing? Given the length of the wall as $12$. Take the length of the base as $x$. Not the answer you're looking for? Browse other questions tagged calculus algebra-precalculus trigonometry or ask your own question.